Whether you desire Rescue and EMS support for a full maintenance outage, are conducting a work task in a location where specialized rescue capabilities would be needed to extract or remove an injured or ill worker, or are making entry into a single Permit Required confined space requiring an OSHA compliant rescue contingent, our Rescue Service Division is ready and able to assist you. Whatever your rescue needs, we will team with you to ensure the most effective standby rescue solution, performed by highly qualified, trained, and experienced professionals, is deployed at your worksite where you need them and when you need them. We provide service coast-to-coast from both our New York and Arizona locations. OSHA 1910.146 states that when employees enter permit required confined spaces that employers must “Develop and implement procedures …, for rescuing entrants from permit spaces, for providing necessary emergency services to rescued employees, and …”. 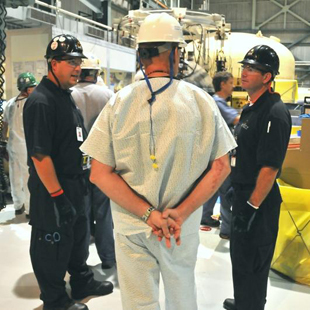 OSHA requires employers to ensure the rescue of an incapacitated confined space entrant can be affected in a timeframe commensurate with the hazards of the space. This can be accomplished through use of trained and competent in-house rescue personnel, or through use of an outside rescue organization – either private contractors or municipal fire department. Why Safety Compliance Services for your Rescue Service requirements? What makes us different from most other rescue services is we are not just a group of firefighters who are practicing the rescue trade in our off-time. 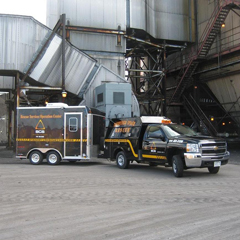 We began as a Safety company providing many years of safety support to industrial clients before we began providing standby rescue service. This allows our rescue team to provide unparalleled safety support to our customers in addition to highly proficient rescue service. 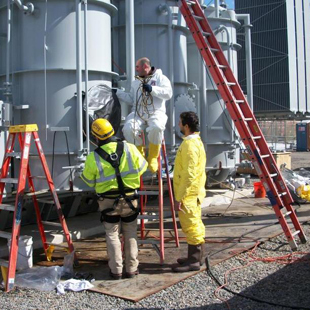 When deployed, our rescue service is first and foremost a support mechanism to assist the customer in preventing an incident that necessitates the need for confined space or technical rescue. Should such a need arise, however, our rescuers are all highly trained, experienced, and well equipped to execute such rescues. > All of our rescuers (many of whom are professional firefighters) are employees of Safety Compliance Services fully covered by workers compensation insurance. Most employers have little understanding of the capabilities and operating protocols of a typical municipal Fire Department. Myth #1: All fire departments are trained in confined space and technical rescue and can arrive at an employer’s worksite quickly and expeditiously affect a confined space or technical rescue. Reality: This is NOT the case in the vast majority of fire departments across the country. Many fire departments have little or no capability to conduct safe and efficient confined space or technical rescue and rely on a mutual aid system to receive assistance from neighboring departments that may have such capability. This may mean the nearest technical rescue team is many minutes and even hours away from the worksite where the employee is trapped or injured. Myth #2: All firefighters belonging to Fire Departments with technical rescue capability are trained in technical rescue. Reality: Technical rescue requires extensive specialized training. Therefore fire departments with such capability designate specific individuals to receive such training and take part in technical rescue emergencies. In many cases, this means the confined space rescue contingent in many fire departments may take more time to respond to the worksite than the normal response for fire or medic. Myth #3: Fire Department response times meet OSHA requirements for timely rescue. Reality: During confined space entries at a worksite, the local fire department is not necessarily available for immediate response in an emergency. The local fire department technical rescue team responds to all natures of emergencies depending upon the particular department organization, which means most technical rescue teams also respond to calls for fire, medical, or other non-technical rescue emergencies meaning they may not be immediately available if and when they are called for an emergency during a confined space entry operation. 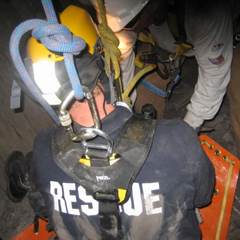 In fact many fire departments with confined space rescue capability are unwilling to be the “designated” rescue service at a worksite within their jurisdiction due to their inability to guarantee “timely” response 100% of the time. Myth #4: Notifying the Fire Department’s technical rescue team of the confined space entry operation satisfies OSHA’s requirement of ensuring an available rescue team. Myth #5: If the local Fire Department has confined space rescue capability, they can be designated as the rescuers for a worksite during confined space entry operations. 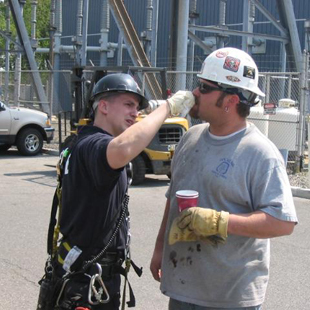 Reality: Although many fire departments have highly skilled, well equipped, and very competent confined space rescue teams, OSHA states an employer who designates rescue and emergency services is required to: “Evaluate a prospective rescue service’s ability, in terms of proficiency with rescue-related tasks and equipment, to function appropriately while rescuing entrants from the particular permit space or types of permit spaces identified”. It is the employer’s responsibility and obligation to evaluate the rescue service’s capability and proficiency in conducting rescues from the types of confined spaces present at the worksite before they may be designated as the rescue service.